This page is about the German fighter Fw 190 A-5/U2. For other uses, see T-34 (Family). The Fw 190 A-5/U2 is a rank III German fighter with a battle rating of 5.3 (AB), 4.3 (RB), and 4.7 (SB). It was in the game since the start of the Open Beta Test prior to Update 1.29. "Würger" is the German nickname of this beast of a plane. It can be translated as slayer, choker, or strangler. They fit the English designation rather well, too: The "Butcher-bird"
The Fw 190s are fighters, however, this one can operate in a multi-role by loading external payloads. The added ordinance will increase the aircraft's damage dealing capability, however, it will also negatively affect the fighter weight and aerodynamics, thus its combat ability too. Using it as a fighter-bomber (German: `Jabo´) is generally not advised, whereas this would typically be the duty of the 190 F-8. The best load out for a bombing role is a single 500 kg bomb. This will allow for slight inaccuracy as the extra 50 kg bombs are usually useless except a direct hit. To attack, be 1 km (3,000 ft) above the target and dive with throttle back and combat flaps extended with the aiming recital just in front of the Target. At 300 m release the bomb and use full elevator to pull out of the dive (don't forget to retract combat flaps during pull-out). Note if the altitude is any lower without a timer when detonated, the bomb may also destroy you too. If attacking ships, attack inline with the Stern and bow to give you more of a target to hit, attacking from the port or starboard sides gives you a very small margin of error with the bomb falling short or going long past the ship. The two cannons are arranged with one mounted in each of the wings near the wing roots. If continuously fired, both cannons will run out of ammunition at the same time. The Fw 190 A-5's instrument panel. The Fw 190A-5/U2, as all the planes in this line, are some of the best "Boom and Zoomers" in the game and should be flown exclusively in this style. The performance at high speeds is excellent, as is their dive and zoom characteristics. 'Do not ever engage in a turn fight as this will most likely end bad. Instead fight only in the vertical. Try to have an altitude, or speed advantage over your opponents (by climbing to the side at the start of the battle and then enter the highest battle you see). But you can still win fights, when you are lower in energy than your foe. 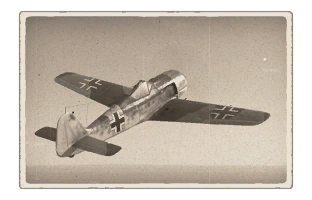 In the defensive, you can often just dive away from planes, such as Spitfires and La-5s, but you need at a decent altitude to gain top speed, so do not be too quick to dive after an enemy, if they fly below your plane. Unless you are higher then everybody else, or alone. Just be sure then to have the time to regain the lost altitude. In a dive the 190 can, due its short wings, pull quite some stunts to either lose the hunter, or even make him loose his own wings! This is favourable strategy against La-5s, Yaks & Spitfires who have due their low wingloading (and partly woodenwings for the Russians), less resistance against high G maneuvers. Again be sure to regain your energy by a zoom-climb. Just look out while doing so, many pilots die as they do not notice a second enemy aircraft approaching. German proverb:"Wenn Zwei sich streiten, freut sich der Dritte." ~ "When two quarrel, the third will reap the success." Of course this could also be you. When facing a A5/U2 you want to start out with an energy advantage. Things that you don’t want to allow are head ons or prolonged dives, both of these favor the FW’s durable construction. Other things that you should be wary off is to never underestimate the high speed agility off the FW or its ability to sustain damage. If you can get a FW to engage in a prolonged turnfight then you’ve essentially won. FW's are going to position themselves in a way that either allows a head on or a dive on your tail, by cutting into their dive you can force them to steepen it and most likely have to zoom out . Head ons are best avoided unless you’re in an equally well armed and armored plane such as an F4U-1c, in which they are still risky. Suspended armament provides devastating firepower only rivaled by some heavy or jet fighters. (AB) High battle rating of 6.0, often pitching it against planes that can out-turn, out-climb and out-run it. Additional armaments impact the planes performance significantly more than most other gunpods. This page was last edited on 15 April 2019, at 11:05.